Cupcakes for Kids is a great starting point in teaching the children how to bake and decorate cupcakes. Our friend, Courtney Cupcake, is going to drop by on the children's pages and give some useful tips and advice to help the kids cooking in the kitchen. It really does seem that children are becoming interested in cooking again. I don't know if it's due to the success of cooking shows on television, such as Masterchef and Junior Masterchef, but my kids are definitely more interested in what's for dinner, what's in it and even asking "Can I cook tonight?" This interest by the older children is also evident in the youngest but she wants to bake. She loves to make cupcakes and cookies and baking is a great way to start teaching children about food. 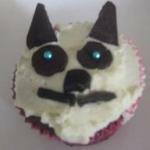 Eight year old Elizabeth sent in this photo of her cat cupcakes. Don't they look fantastic? We would love you to send photos of your cupcakes into us so that we can include them in our kids pages. Cupcakes, in particular, give reasonably quick results and the children really enjoy frosting and decorating. This almost becomes the treat at the end for following the recipe correctly and finishing the initial clean-up! So many children have written asking questions about baking so that is why these Cupcakes for Kids pages have been built. The aim is to provide very easy cupcake recipes, together with tips and techniques to help the beginner chef!! I love seeing the kids cooking and they love seeing fantastic results. Follow these tips below and they will be creating masterpieces! For all your cupcake frosting and decorating needs check out Amazon.com. They have a great range of sprinkles, toppers, cupcake liners and cupcake trays for both the beginner cook and the more experienced chef! Have you been busy learning to cook and baking cupcakes? Send in your recipes and photos to Courtney Cupcake and she can share them with our readers. Courtney, and all our readers would love to hear your stories and see your photos. Share it! TGIF.. its time to enjoy with my kids, playing and baking at the same time is priceless.